Lohars.Org - Connecting all Vishwakarmas, Lohar, Badhai, Sonar, Tamrakar, Murtikar, Jangid, Panchal, Suthar and all. According to Vedas Vishwakarmaji created Brahma, Vishnu, Mahesh and gave them power and direction to create and run the world. Parmapita created Gayatri from his body and gave birth of 5 Rishis so Vishwakarmaji had five sons - Manu, Maya, Twastha, Shilpi and Devagya. 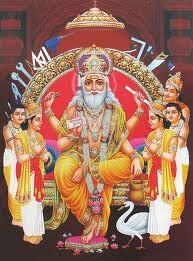 The eldest son of Vishwakarma Bhagwan was Manu, married with Kanchna, daughter of Rishi Angira. 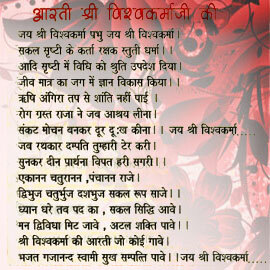 Rishi Agnigarva and Rishi Sarvatomukh were born in this clan. Second son was Maya married with Sulochana, daughter of Rishi Parasar. Oaj, Mahoaj, Vishnuvardhan and Suryatanti were born in this clan. Third son was Twastha, he was married with Jayanti, daughter of Rishi Kaushik. Fourth was Shilpi, he was married with Karuna, daughter of Rishi Bhrigu and Sage Devagya was the fifth son of bhagwan Vishwakarma, he was married with Chandrika, daughter of Rishi Gemini. Sanaga Gotra Son of Sage Manu(Shiva) known as Blacksmith (Lohar). Sanatana Gotra Son of Sage Maya(Vishnu) known as Carpenter (Badhae). Abhuvana gotra Son of Saga Twashtha(Brahma) known as Bronze smith (Tamrak). Pratanan Gotra Son of Shilpi(Indra) know as Architects (Murtikar). Suparna Gotra Son of Devagya(Surya) know as Goldsmith (Sunar). 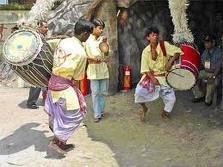 These five gotras are further divided into a total of 25 sub-clans called as upagotras. Virupasksha, Charuhasta, Bhadradatta, Brahmadikshita, Vedapala, Shilpi, Aditya, Yajna, Vipala, Revata and more. 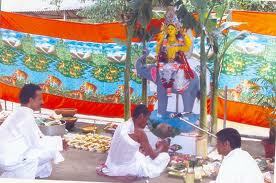 Vishwakarma Puja is celebrated widely on every year 16 or 17 September. This is time of resolution and an inspiration for workers, craftsmen and engineers to create new products and increase productivity. 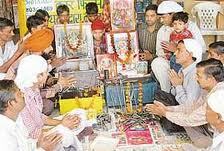 They make resolution from this auspicious day to perform better. 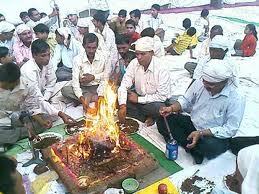 This ritual usually takes place within the factory, workshops and manufacturing unit premises. We belongs to the Parusheya Brahmin community. These brahmin migrants who settled in Bihar, Madhya Pradesh and Maharashtra identify themselves as Maithil Brahmins. Vishwakarma from Maharashtra identify themselves as Vishwa Brahmins Vishwakarma from Gujarat identify themselves as Panchal Brahmins. In most of these states, Vishwakarma follow Brahmin rituals, rites and have surnames similar to Brahmin. They perform Upanayanan Sanskar ( Thread Ceremony ) and wear Janeo ( Thread ) for themselves and their children.